Today I want to share with you one of my hidden struggles and how I have learned to rise above it. I’m a mom with chronic health issues. I hope my tips will help you if you struggle with health issues as well. I have mentioned briefly before that I have a genetic disorder called Stickler’s syndrome. It affects collagen in the body and as a result deeply affects the eyes and the joints. I am 36 years old and have difficulty getting out of a chair without hip and knee pain. It hurts to walk across a room or sleep comfortably at night. It was discouraging to see my hip x-rays a few months ago, and discover that there’s just nothing left cushioning my hip sockets. And I’m the one that has it easiest in my family. My mother and my sister have it far worse. Why am I telling you all this? I want you to know that I understand chronic health issues. I understand what it feels like to pray fervently for healing, and have YHVH decide to leave this thorn in my side. I truly believe that YHVH cares more about my character than my comfort. I know that Stickler’s is part of my journey and has shaped me and who I have become. I am thankful for that, but I also have to deal with life as a mom everyday, whether I hurt or not. You may be dealing with a chronic health issue as well, and are struggling to keep up with the needs of your family. 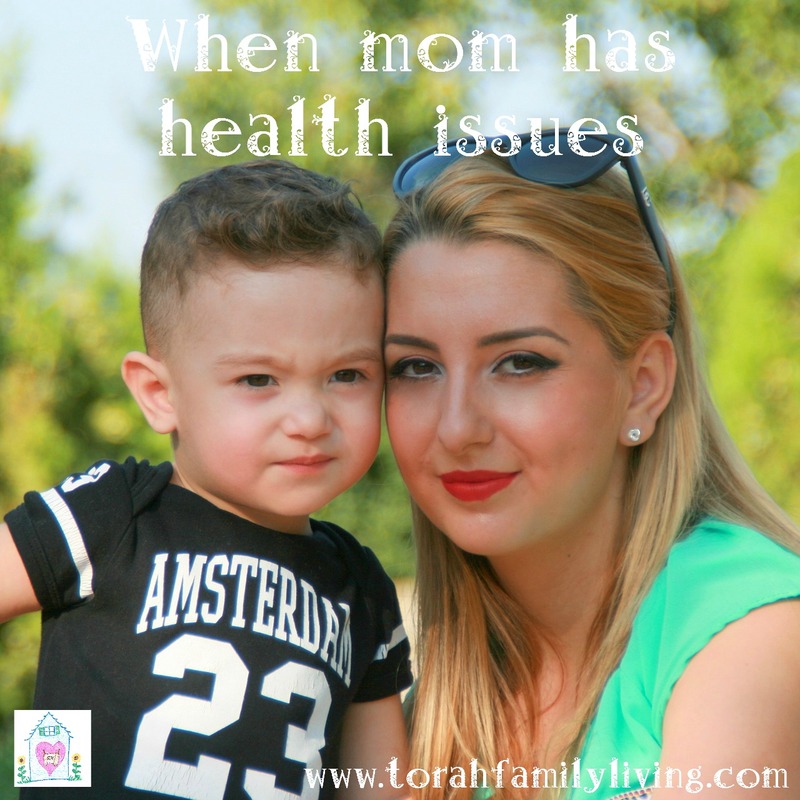 I have learned a lot about being a mom and having health issues. I hope I can give you some practical help and some hope today. One thing I have learned on this journey is that I have to recognize my limitations. I can’t do everything. Being realistic about what I can and cannot do helps me to say no and to prioritize. Since I have leg problems, I don’t take on tasks that require 4 hours of standing. I don’t try to do several stores worth of shopping in a single trip. I also have been forced to prioritize what stays in my life. For me, homeschooling my children, caring for my home, and writing are top priorities. Other things take a back seat or don’t get done at all, and that’s ok! I also prioritize within those categories. I don’t wash baseboards, because it’s just not that important, and I only have so many hours and so much energy. How can you be realistic in your life? Here are some tips. Write down your physical limitations. This is the first step to being realistic with expectations. Prioritize what you really want to focus on in your life. This will probably include caring for your family, possibly homeschooling, and hopefully at least one thing that you enjoy personally. Decide what things in your life just aren’t important enough to stay. Are you tackling too many cleaning tasks and ending up exhausted? Are you taking on too many responsibilities outside the house? Be honest with yourself when future things come up. Just because it’s a good thing to do, doesn’t mean that you are the one that needs to do it. Remember your priorities and say no when you need to. This particularly applies to homeschooling, but being organized will help you in every area of your life. I’m not saying that you need to go to Ikea and get containers for everything. I’m saying that you need to have systems in place for accomplishing daily tasks. When you have a plan for handling tasks like laundry and meal times, life will be easier for you, even with health problems. Let me give you some examples from my life. I have a rotating meal plan. Every Monday, we have burgers. Every Thursday, we have pizza. Every Friday, we have burritos. This helps me to always know what to thaw, when to grind flour, what to put on the grocery list, etc. I also selected meals that are relatively easy for me to prepare, even though they are all from scratch. I use tools to make preparation even easier. I use a crockpot to fix dried beans. I use the bread machine to knead dough. All of these work for me so that I don’t have to be on my feet as long, and I don’t wander around not sure what to do next. Another important thing that I have learned is to time myself. This helps me to not be on my feet too long, or sit in a chair too long, which stiffens me right up. So, I work in the kitchen for 20 minutes, then I sit at the table and help the kids with school for 20 minutes. Lastly, learn how to delegate. I have taught my children basic cooking skills so that they are not completely dependent on me for food. They can cook eggs, make toast, and cook pasta. Most children can begin learning these jobs at the age of six or seven. Thanks to several pregnancy bedrests, they also can do laundry and clean bathrooms. Teach your children to do simple tasks so that you are not required for everything. There are jobs that only mommy can do, but there are plenty of jobs that can be delegated. In what ways can you be more organized to help you get things done in spite of your health? Here are some ideas. Use tools such as dishwashers, crockpots, and bread machines to help you. Organize a repeating task into steps. For example, I clean my kitchen in 6 steps, which can be separated if I need a break. Use a timer to schedule breaks to make sure you are resting enough. Homeschooling is a huge part of our family life. I have six children in school right now, and a toddler running around. One of the big factors in making this work for us is independent learning. I have learned a lot from the Robinson curriculum. We don’t follow it exactly, but we have learned to encourage our children to teach themselves. My older children know exactly what they are required to do in each subject each day. They read a lesson in science, sometimes accompanied by a research project. They read a chapter in their history book, followed by some writing in their history notebook. (I can’t wait to share this with all of you as a finished project!) They read a book of their choosing. They do some spelling and writing. Then they do a math lesson in their Saxon books. (We have been blessed to have Gramma living with us and helping the kids with their math as needed.) While the older children are working independently, I can work with the younger children that cannot read by themselves yet. This didn’t happen overnight, but it was well worth the effort. Every evening, after dinner, I take a look at their work and record it for grades. Then we do a Bible class all together. How can you make this work in your home? Start teaching your children independent learning with one subject at a time. Send them off to read by themselves for 30 minutes. Maybe you can use that time to work with a younger child, or even put your feet up for a few minutes. Learn your natural energy flow through the day, and work school around it. I can handle being up more in the morning, and I hurt more and get more tired as the day goes on. That is part of the reason I sit with the kids in the evening for Bible class. I’m not in any condition to do anything else at that time, so it’s a good fit. Keep school simple. If you are dealing with health issues, whether they are chronic, or perhaps due to something like a difficult pregnancy, you need to simplify wherever you can. Make sure your children are learning the basics well. Don’t sweat the extra stuff. If your children can read, write, and do math well, they can pursue whatever interests them and do just fine. Ok, you have health problems. But that doesn’t mean you have to be a martyr. Your children and your husband need you. If you have ways to improve your condition or at least make it more manageable, you owe it to your family and yourself to take care of yourself. I take an herbal anti inflammatory that helps quite a bit. I also go to my awesome chiropractor every two weeks to help the rest of my body feel better. I eat well. I pursue things that interest me, like knitting. These all help me to be a bit more comfortable and a lot happier. I want to be a pleasant mom and wife. Just because I have these crazy hip joints does not mean I have to live defeated and miserable. I use the tools available to me to help me have a better quality of life. Do you have “medicine” that you don’t take? Remember, medicine doesn’t have to come in a pill. It is anything that helps you feel better. Take care of yourself, so that you can take care of your family better. Sometimes this is as simple as knowing when to call it a day and go to bed. Life with physical struggles is hard. You may get tired very easily. You may be dealing with pain. You may have more than your share of doctor appointments. Sometimes it can be very overwhelming and frustrating. Be honest with yourself. You don’t have to put on a brave face all the time. When you are feeling down, don’t feel guilty for feeling down. Read the Psalms and see how much deep emotion the Hebrews felt. Emotions are not evil, but it is important to find a healthy way to deal with them. I’m a really good listener, but I have a hard time finding someone to listen to me. Men often want to fix the problem, and aren’t very good at just letting a person vent. Doug is sometimes guilty of this approach. Thankfully, I can call my mom. She is dealing with the same issues, only several years down the road. We share our frustrations and have either a good laugh or a good cry, depending on our mood. It helps to just know that someone understands. If you don’t have someone close like that to talk to, there are lots of groups online. You are very likely to find a group of people dealing with the exact same health problems as you. This is helpful for just getting things off your chest, and can also be a great resource for treatment options and coping techniques. Do what you have to in order to find a good listening ear. Just don’t bottle it up inside. That will destroy you far quicker than an illness. Here are some more ways to keep the stress under control. Pay attention to your sleep. When you are better rested, you handle life’s difficulties better. Simple as that. Get outside in YHVH’s creation. There’s something about that outside air and trees and flowers that just makes a person feel better. Pets can have a similar effect. Keep a journal. When there is no one that you can talk to, your journal will listen. I often keep my journals as written prayers. There is no one that understands better or listens better than YHVH. Find a little thing that makes you smile. I like chocolate and pretty notebooks. Little special things that are just for you can do a lot for your mood and your ability to cope with stress. There are lots more ways to keep your chin up for the long haul. What do you do to keep stress dealt with and in its’ place? I saved the best tip for last. Never forget that YHVH has a plan for your life. I would like to direct you to an excellent article on YHVH and genetic problems. It will give you a good perspective. It has taken me a while, but I have finally come to the conclusion that YHVH knows what is best for me. He also wants to use my life to glorify Him. And YHVH said unto him, Who hath made man’s mouth? or who maketh the dumb, or deaf, or the seeing, or the blind? have not I YHVH? YHVH has not chosen to heal me or my mother or my sister or my children. I have to conclude that He has a reason for putting this difficulty in our lives. Sometimes He chooses to heal. But sometimes, and I think more often, He doesn’t. This is not a question of whether or not I have enough faith. My faith doesn’t heal me. YHVH heals. Sometimes, He knows it is better for me to overcome the pain each day, and still choose to serve Him. Constant seeking after healing can become an instant gratification attitude that does not bring Him glory or help me to serve Him better. I can still serve YHVH each day, even though I have difficulties that others do not. When I am weak, YHVH is strong in my life. I hope that even this blog post will bring glory to Him. I desire for you to accept the plan YHVH has for your life, even if it includes health issues. I want you to choose to serve Him in whatever capacity you can. I want you to praise Him in the face of obstacles. We, as His people, need to learn to climb the mountains, rather than beg for YHVH to flatten them. When we overcome in His power, He is glorified. What about you? Are you struggling with chronic pain, or long term health problems? Has it been a daily battle to care for your family? Please take some time to tell me about it. I would love to join you in prayer, and help you with any tips that would make life easier. What tips did you find most helpful today? We live like you do, with cronique illness. It came some years ago – I guess when poisining from mercury and the higher radiation knocked us out. Or not completely, because Jesus was there, taking care of us like nobody can! The other MCS, Multiple Chemical Sensitivity= Can not be health in environments where there is perfumes or chemicals. OR near by persons who wear it. I will not today completely describe how hard it is to be strugged by MCS, just tell you that HE who made us, He really took the top of it, when we had our mercury fillings in the teeth removed in 2012. Untill that time, in almost 2 years, I needed to wear a gasmask to get around. It was not easy or funny. The worst hing really….. it is that we have had a so-called “normal” life, when we could get around, get on vacation, go and visit people, do everything. Now things are surely different, but God shows Himself to be even greater IN THE struggles! Blessed be His Name! Both of the above mentioned things we did are worth a try, even if you don´t recognize any problems using wireless gadgets or don´t recognize any sympthoms close to perfumes. We use to tell people (because it/radiation affects everybody having a body, all the way into the cells, the DNA, the brain and all of us….) TRY, even just a weekend, or another time when you are able to be alone with your family, plug the wireless out for the weekend, -remember battery in the DECTphone, it helps a great deal- and first of all feel if you slept better during that weekend. Even pains can go quick if you shut the wireless down, a lot of people have experienced that. This EHS really gives us a hard time to get around, in Denmark it is almost impossible. We buy most of the groceries from home, online.It is good that it is possible, but it is lonely. Praise Him who loves us like that! But she as well can not cope with the radiation almost all around, suffering from MCS and EHS. 🙁 And Denmark has chosen to put up Wifii everywhere, also in the schools. We have a hard time because of that. Untill now no everybody wants to hear that France did ban the wifii a lot of places, for example in the schools and made laws and regulations like a lot of other countries does. They do not want to hear that it really is possible cancer-prompting, that radiation. YES, we pray for God to heal us, but He has not chosen to do yet. HE did this wonderfull thing, giving us a home in a wonderfull spot of this land, where radiation is lower= we can go out to enjoy our garden and try to grow some vegatables. We can as well have some pets, right now a rabbit, chickens and a dog! 😀 It really helps us not to stumble and be in sorrow all the time. And it was wonderfull, if one can say so, to read this today about yuor struggles wich is a little like ours. Can not stand at my legs all day either. And really…. can not sit with the computer that long, even though it is all cabled, it is shileded the most from low frequency EMR. But I have to…. mostly to do the duties. This afternoon, somehow God blesses me with reading this when we try to anjoy shabbath untill saturday evening (or sometimes untill sunday morning!). The danes however…. the rest that are godfearing, or wants to be, rest on sunday, so sometimes we take 2 days of rest. Thanking Him who gives us this day of rest! I really hope that your prayer quoted in the beginning, will be revealed upon us. Just as we pray for you and your family, it was a blessing when we found your page. Still is! Thank you for inviting us to share…. not a lot of people understand what we need to deal with. But Jesus does, and you do! Gratefully for allways having Him to listen and help! Shalom from all the 3 of us i Denmark. loved hearing this! i too struggle with health issue, specifically hashimotos . I would love to know what your anti inflammatory is. Also, the most natural I can do for my thyroid that actually works is derived from pork! Would love to know your thoughts on this- so I take a synthetic that causes more problems than not or the one most like me? I use a combination of boswellia, turmeric, ginger and celery seed for an anti inflammatory. My MIL has thyroid issues, so I can check with her. I know she uses iodoral, I believe it’s called. I have thyroid issues as well and I have found that homeopathic works well and I have been able to stop all meds and just use homeopathic. I use http://www.homeopathyinformation.com. Thank you for your blog! I was just introduced to it tonight and I am so excited to explore it all! Thank you so much for posting this! I also have health issues, so it’s really nice to know that I’m not alone!! 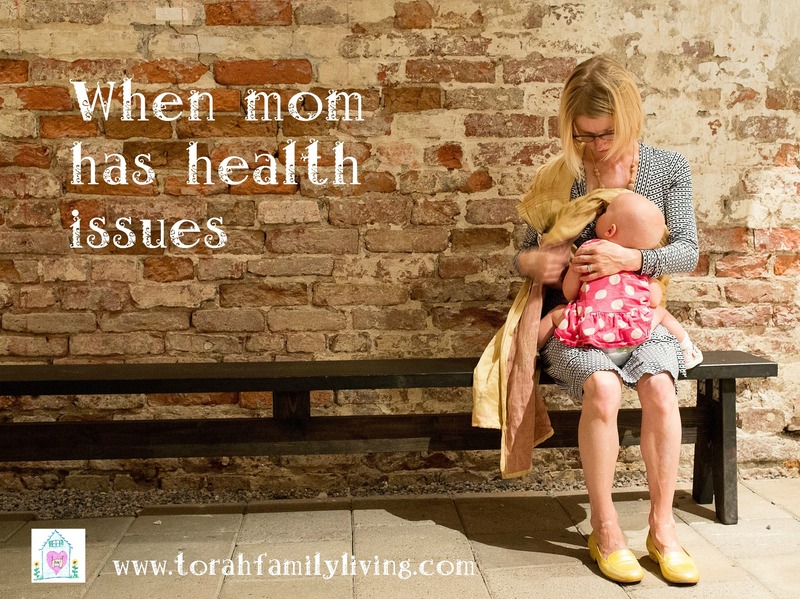 It seems like moms with health issues has been something no one wants to talk about. But I think it’s time we all start talking about our struggles so we can support each other. Many hugs to you! I am glad you are here! Yes, I agree that it is so important to be realistic with yourself. Right now I am recovering from a hip replacement, and I’m still reminding myself to be realistic lol. Praying for you! YHVH’s grace is most certainly sufficient.